As a math major, I am often asked the question, “Why math?” In particular, why theoretical math, when it doesn’t seem to be related to anything? I often have trouble coming up with a full and satisfying answer on the spot. Math is one of the subjects whose material and categorization can be confusing. It spans several fields that many have not even heard of. When I say “topology” or “analytic number theory,” it often draws blank stares; in fact, topology is often misunderstood as “topography,” the study of terrain. Well, here is my more thought-out answer to why I study math. Through the cryptic jumble of symbols, you might ask yourself, how is this useful? An even more relevant question for most readers is, what does it even mean? As it turns out, this particular equation has very little practical value. Yet it is one of the most fundamental equations in the field of analytic number theory, and it is a remarkable statement about the prime numbers. It basically links the infinite set of natural numbers (1, 2, 3, 4, 5,…) with the infinite set of prime numbers (2, 3, 5, 7, 11,…). The proof is relatively simple, but I am not going to give it here. It is known as the Euler product formula. There is virtually no “useful” information given by this highly abstract formula. It doesn’t help with daily finance. It doesn’t solve traffic congestion. It doesn’t even help in landing a rover on Mars. But it does is provide us with an insight into the fundamental truth of nature. In a way, this equation exceeds the known universe, as according to current theory, the universe is finite. The equation, by contrast, deals with the infinite. In fact, modern mathematics is full of statements and theorems that have currently no practical use. There are entire branches and fields of study that are, in essence, useless. Sometimes, useless things have applications in the far future. Complex numbers, for example, were invented centuries ago, but didn’t really find any use until modern electronics and physics were developed. Maybe everything we know today in math will be applied somehow. But this cannot happen forever. The universe is finite, after all, and knowledge is infinite. Sooner or later, or perhaps even now, we will have found knowledge that serves no use in our universe. This leads to the next question. Should we seek knowledge for the sake of knowledge? Is a culture with more knowledge inherently richer than one without? Historically, knowledge in the form of technology had the power to save oneself, one’s family, and even one’s country. Entire civilizations were wiped out due to the technological superiority of the invaders. Knowledge has for a long time acted as a defense tool. So perhaps we should embrace new knowledge for the sake of defending against a future alien force. But what about afterwards? Assuming humans survive long enough to establish a galactic presence, and have enough technology to be virtually indestructible as a species, so that survivability is no longer an issue, what will be the point of further knowledge? 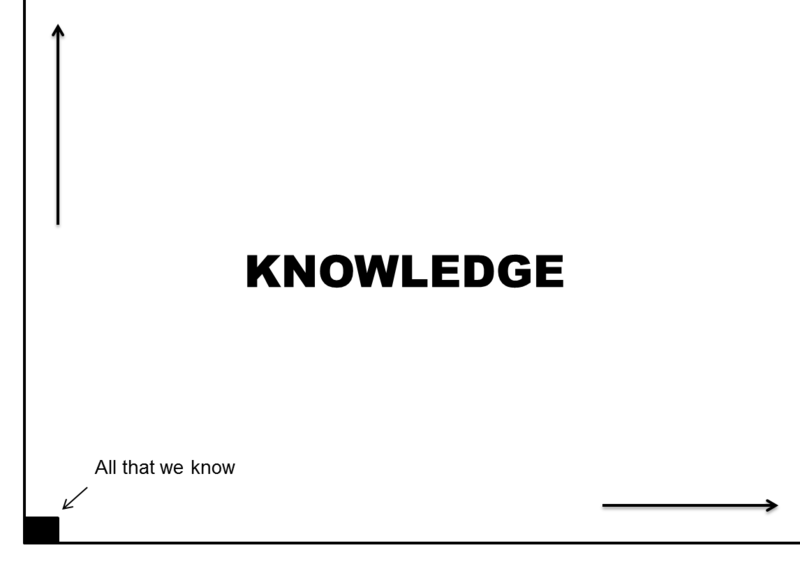 What will be the point of knowledge for the sake of knowledge? 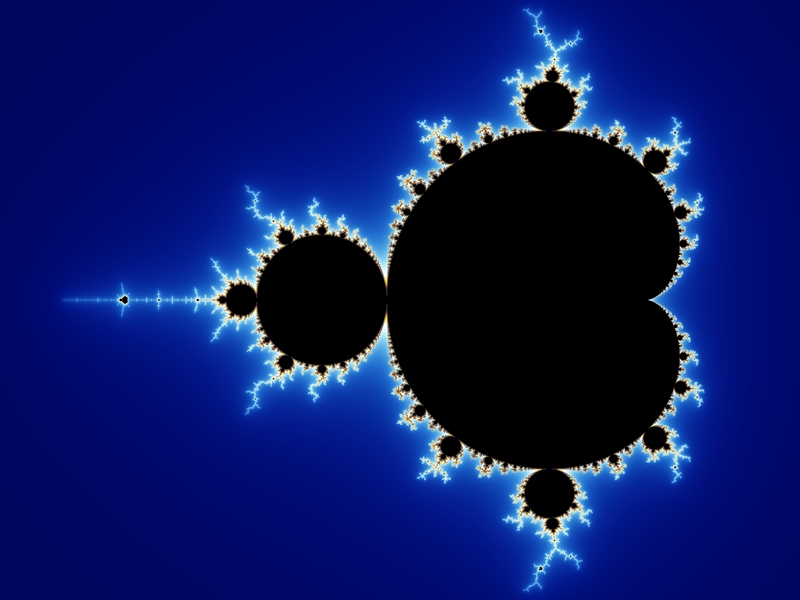 There could easily be no purpose to this fractal, yet it certainly holds some value. It is aesthetically pleasing, and the ability to zoom in on the image forever raises some old philosophical questions. In this sense, it is almost like art, only the rules are completely different. In essence, knowledge for the sake of knowledge is what math is all about. There is no intrinsic need for math to apply to the real world, nor does any topic in mathematics need an analogy in real life. Math is knowledge at the abstract level. Recently someone asked me what classes I was taking, and when I mentioned topology, he asked if that was a map making course. Topology and topography sound quite similar, I suppose. In any case, topology is a great example of what pure math is about. It is the underlying foundation behind geometry. Geometry is highly applicable in real life, because shapes, sizes, and angles of things all affect the way they work. But in topology, sizes and angles do not matter. A line is the same thing as a curve, a square is really the same thing as a triangle or a hexagon, and a sphere is really the same thing as a cube or amoeba. And a donut is really the same thing as a coffee mug. These fields of math are totally alien to the math taught at the pre-college level. Geometry, basic algebra, and calculus are about sizes of things and comparing objects to determine their shapes, lengths, volumes, etc. But when you get to the higher fields, such as analysis, number theory, abstract algebra, and topology, everything completely changes. They feel like entirely different subjects than the math taught in middle school and high school. Previously, you were told that dividing by zero is impossible and that it is pointless to think of infinity. But in complex analysis, you can actually “cancel out” zeroes and infinities provided certain properties are counted, and you actually care about where functions hit infinity and how often they do so. And in set theory, you discover that there are actually different sizes of infinity. These facts are much more interesting than, say, the quadratic equation, which is taught in every high school algebra course. The fact that zeros can actually cancel out infinities, or that there are different sizes of infinities, is much more interesting than such a formula. This graph, showing a region of the gamma function, generalizes the notion of factorial (i.e., 5! = 5 * 4 * 3 * 2 * 1) to complex numbers. The gamma function is also closely related to the equation at the very top of the page, with the natural numbers on one side and the prime numbers on the other. Those two expressions also define the Riemann zeta function. You might be able to see some relation between the two images. 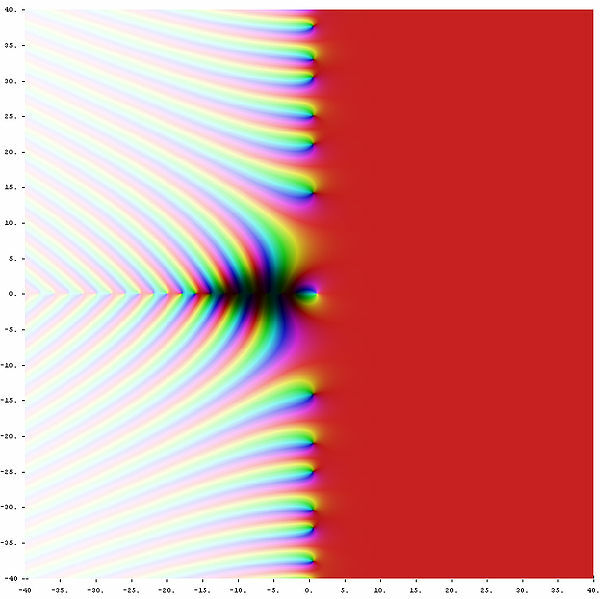 It turns out that the trivial zeroes of the zeta function, which can be seen as the strange color mismatches on a line going from the center to the left, are the result of the poles of the gamma function, which are the vertical spikes in the other picture. Basically, that is why I study math. The point is not to memorize formulas or to calculate quickly. It is to discover fundamental truths out of ridiculous-sounding things, and to make sense out of them. In a way, this is what people do in other academic fields as well. Sometimes math goes over the top and seems completely useless. This is bound to happen. But some things, like art and mathematics, don’t need a practical purpose to exist. Such things are valuable in their own right.